It is almost midnight, yesterday. 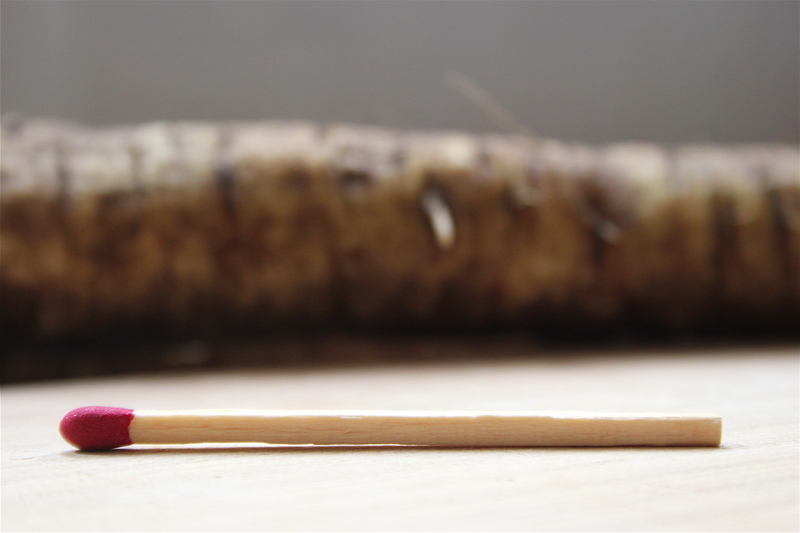 I’m looking over my two attempts to put burdock root into words for you to read when you wake up with your coffee today. And I’m wondering if the thoughts on the page meander so much because I don’t have a history with this root. Since my burdock memory reaches only back to here, let’s begin at the beginning. We’ll start with Sunday. It was glorious. 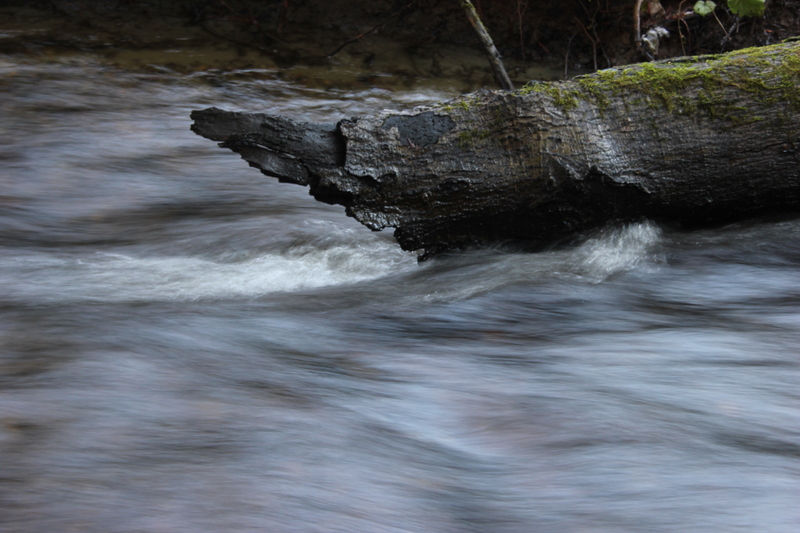 I took a walk down to the creek that cuts behind my in-laws’ house to practice with my camera and breathe fresh air. The sunlight was making mottled designs on the tree trunks, backlighting the moss, running downstream over the pebbles. 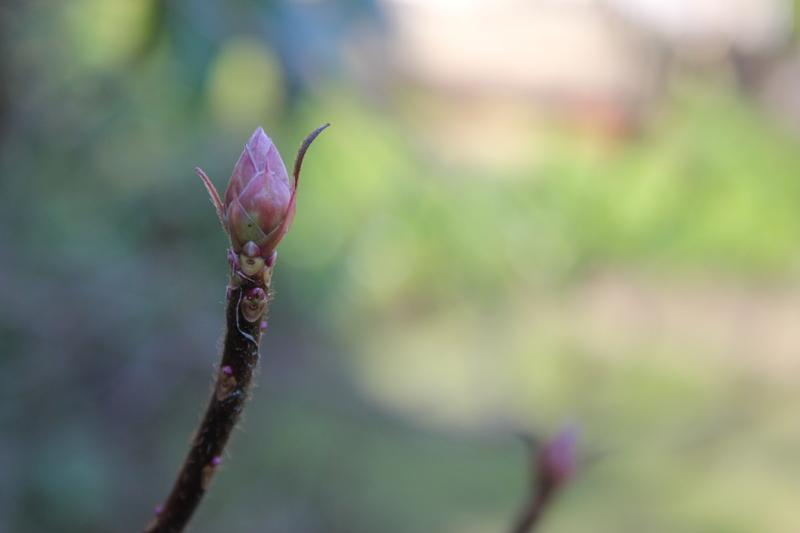 I usually don’t worry about spring until it’s here, but even I could feel a touch of the fever. Sun, sun, sun. So I was refreshed and ready for Tuesday night, when my husband and I attended a knife skills class here. 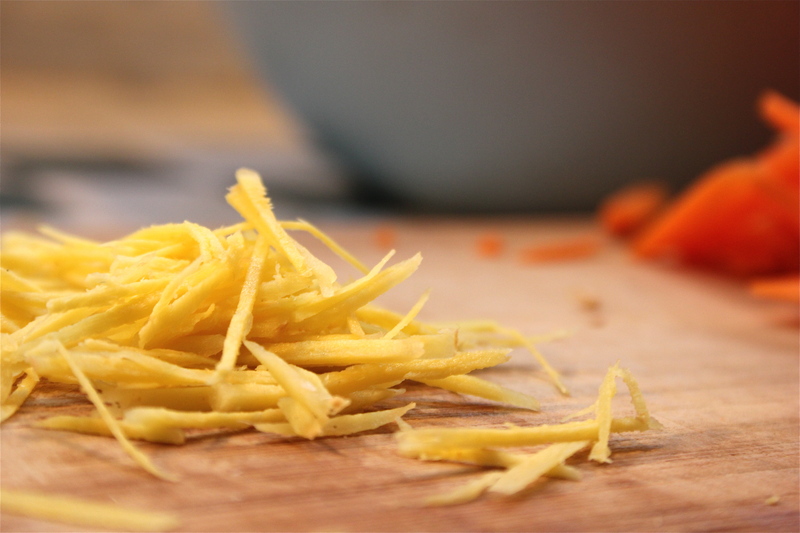 It was a great luxury to spend two hours learning to mince, dice and julienne vegetables. Friends, I brought my camera and was wincing over all the lost shots. Soft piles of romaine lettuce in chiffonade. Plucky matchsticks of zucchini and carrot. A thin stream of olive oil catching the light on its way into a vinaigrette. But you’ll just have to imagine it. I had no time for photos. Our instructor (Godlove‘er she’s good!) is particularly attentive to the julienne cut and now I can see why. Matchsticks. It’s time-consuming for a novice like me to try and cut a handful of identical little sticks. And my not-a-chef status was confirmed when I prepped the vegetables for today’s recipe. Now I’ll take you back to 10:30 yesterday morning. I’m standing over a cutting board, gripping (now properly) one of our chef’s knives. 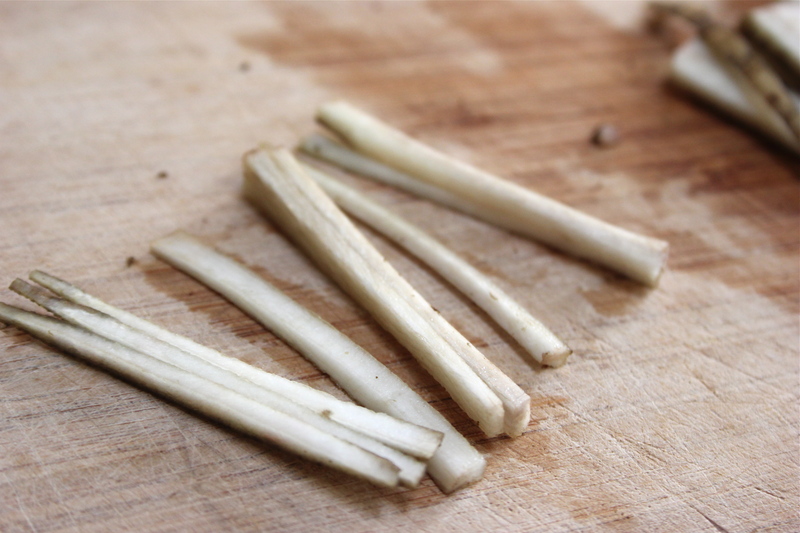 I’ve just cut the burdock root into one-and-a-half-inch chunks (julienne = one-eighth by one-eighth by one-and-a-half!) and am laying them on the board, one by one, where I carefully slice and stack and slice again. I’m getting there. But it will be awhile before I can cut like this. I’m so glad for the time I put in though because the resulting side dish is pretty, as well as fragrant and nourishing. 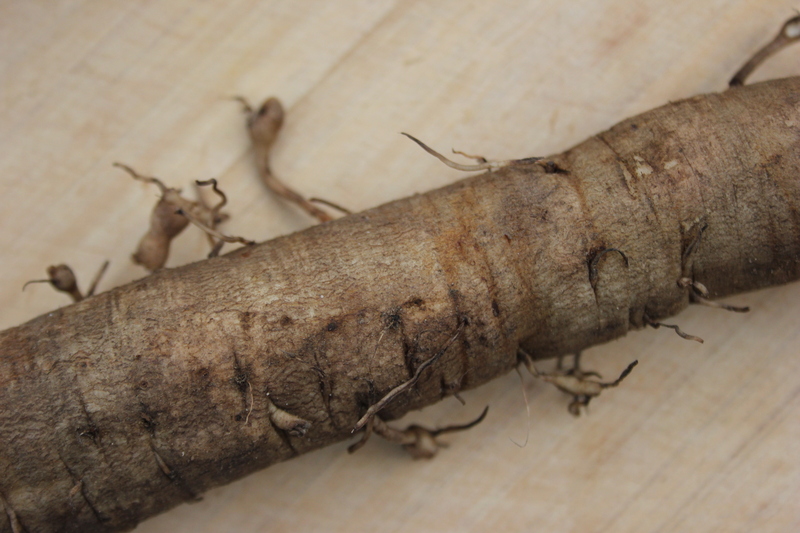 A lot of people give burdock root a bad review, but I’m a little enamored with this nutrient-rich root. It seems to take on the flavor of the dish. In Chie’s miso kabocha soup it tasted mild, soft and a little salty . In this dish, the sticks soak up the tamari and sesame oil and because of the saute, they’re crunchy, and even somewhat sweet. Note: Let’s just stop saying we’re doing a “series” on mushrooms. The grower will be available sometime soon and when he is, we’ll cook with one or two more mushrooms. Can’t wait to bring you that delicious adventure! 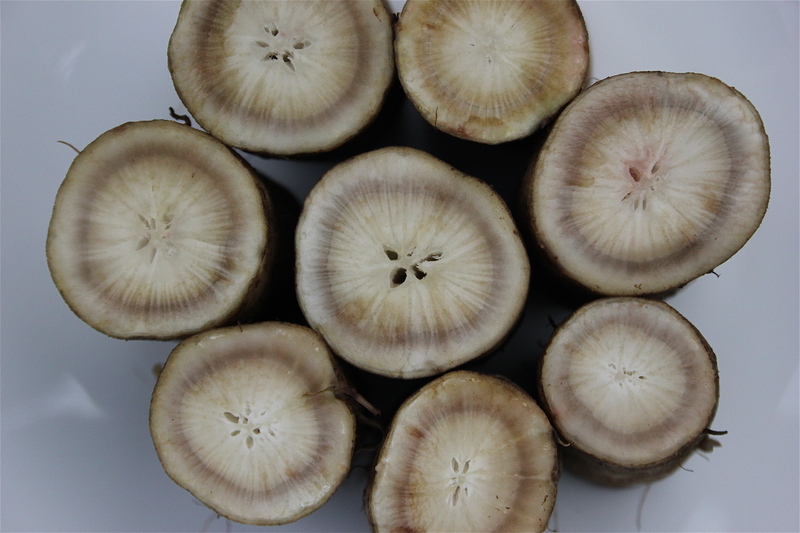 growsburdock root, to still be getting it in January! Who is responsible for this? who asked them to grow this blood cleanser of a root a couple of years ago. bowl full of water to prevent from discoloration until ready to cook. 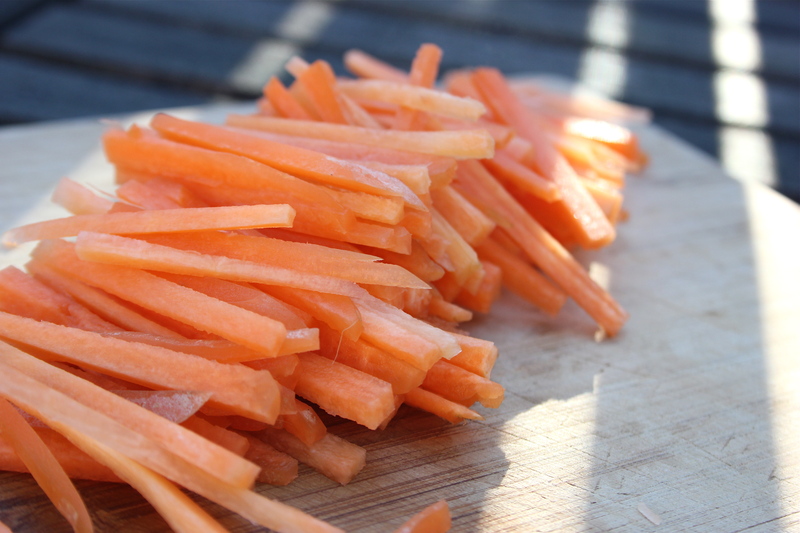 Julienne the carrots. Drain the burdock well. In a wok or medium sauté pan, heat the oil. 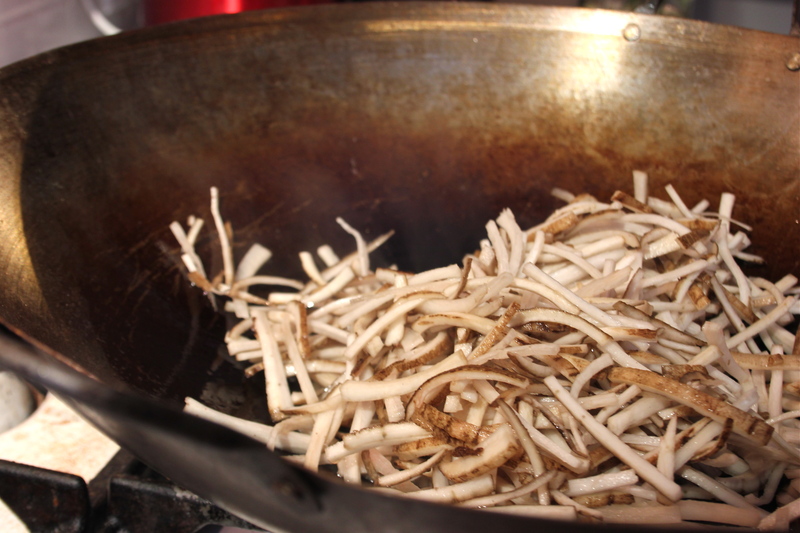 Saute the burdock until it starts to caramelize. Add salt then the carrots and ginger. Cook for another 7 minutes, until it starts to caramelize. 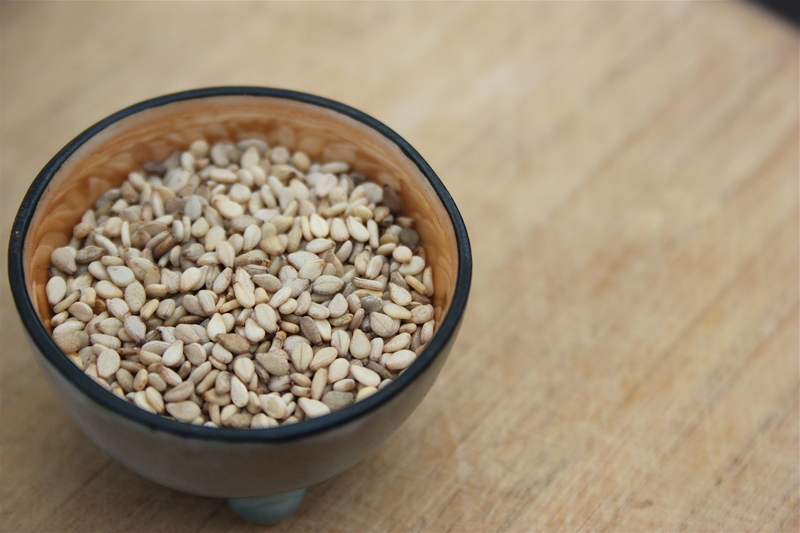 sesame oil and sesame seeds. Enjoy warm or at room temperature as a side dish. 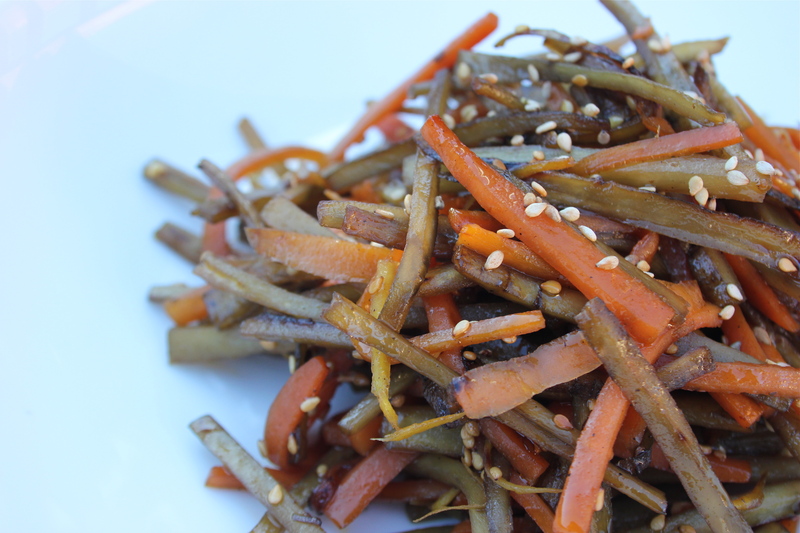 This entry was posted in Recipes, Winter Vegetables and tagged Burdock root, Carrot, Salt. Bookmark the permalink. Great post! I love your photos and descriptions of the process. Now I want to try the dish. Thank you for reading, Woesha! 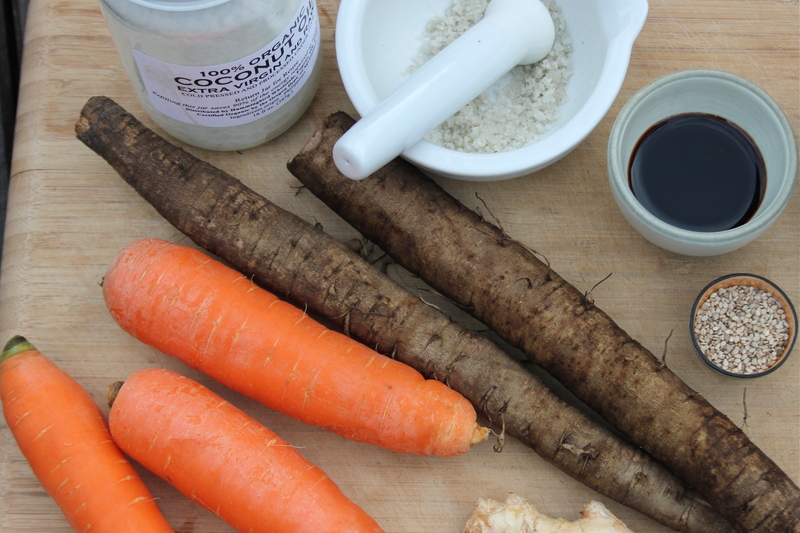 Do let me know if you try it – I’m curious to know what others will think of burdock root. Jenni, Another great post! I wish I could get these ingredients where I am. I am motivated to see if I can. 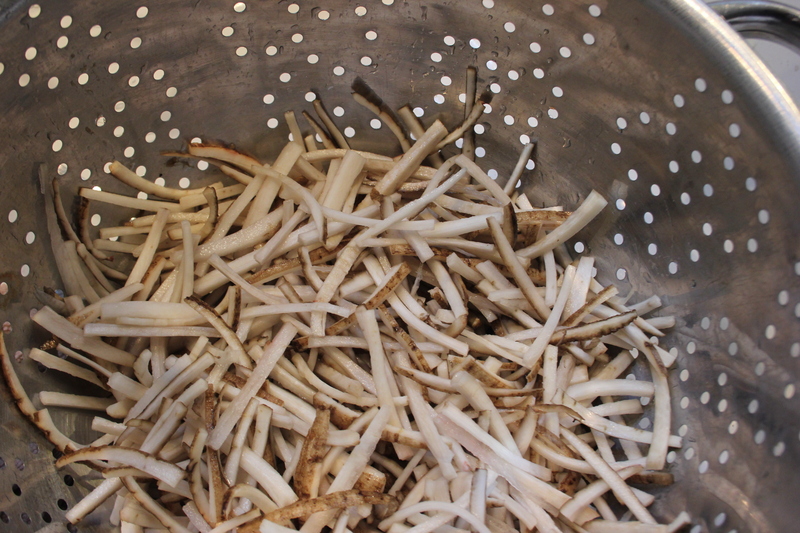 Is burdock root regional this time of year? All times of the year? Your prose, photography and obvious love for preparing fresh, yummy food is inspiring. Thank you, Julie! I’m not sure if burdock is regional or not. 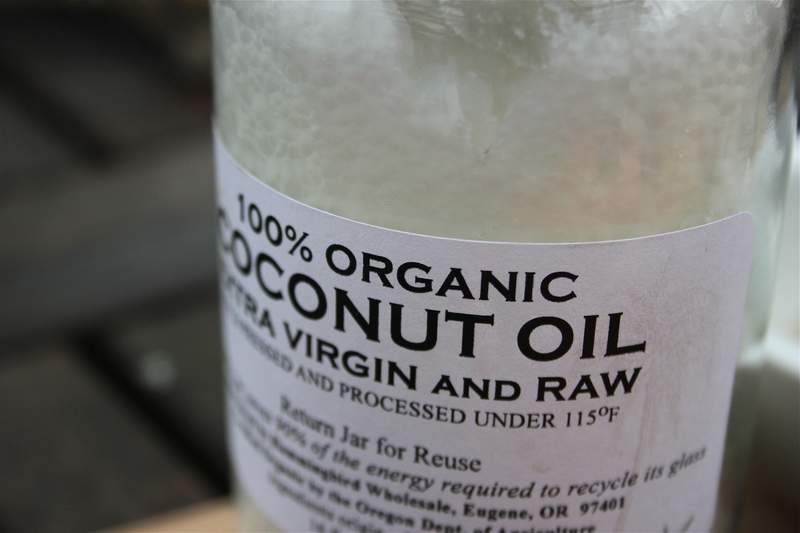 If you have a food co-op or natural food store they might have it. It’s a popular root in Asian cooking so perhaps an Asian food store would have them. And I forgot to mention that soaking the cut roots, in addition to keeping them from browning, makes them less bitter so be sure to do that if you give it a try. 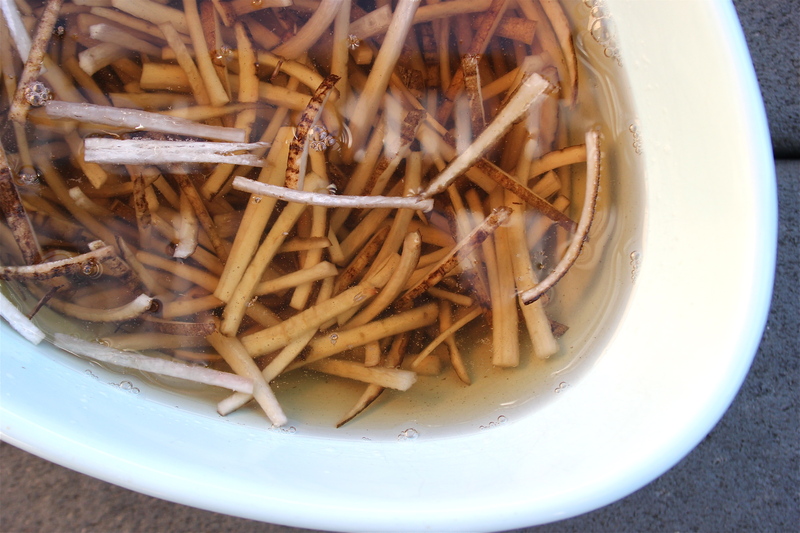 I use dried burdock decocotions (boil in water for 40 minutes) all the time as a base for my bone broths. 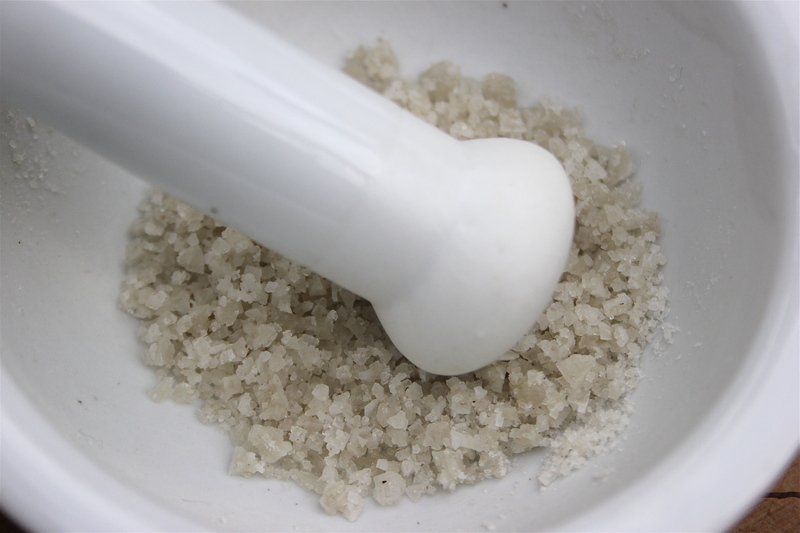 Great for liver cleansing and skin issues. It is a weed and you can find it growing in urban places but good luck harvesting it…those roots grow deep and break easily in hard (most urban) soil. I have also tinctured it but never eaten it fresh. How cool! Can’t wait to try it. If you do try it, Kath, save some for the next day. We warmed up the small bit that was left and it was even better after a night in the fridge. And I had no idea it grew as a weed, though I’m not surprised that it would be difficult to harvest – those are some long roots! Very cool uses. I’ve only eaten it fresh so I’ll have to branch out and try it dried. I love your pictures! What kind of camera and lens are you using? 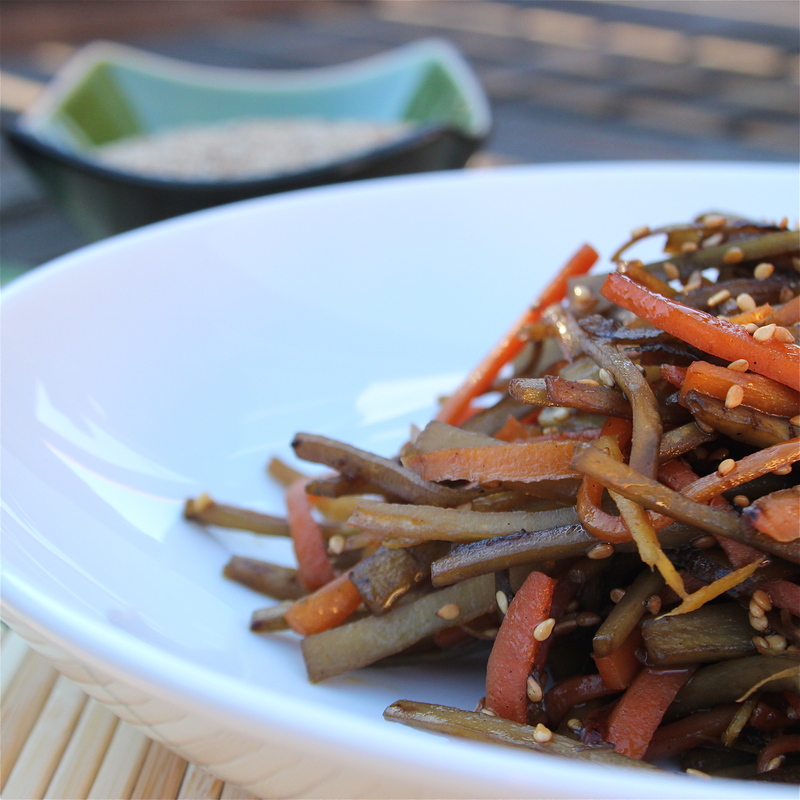 Your Sesame Winter Vegetables recipe sounds and looks delicious. Thank you! 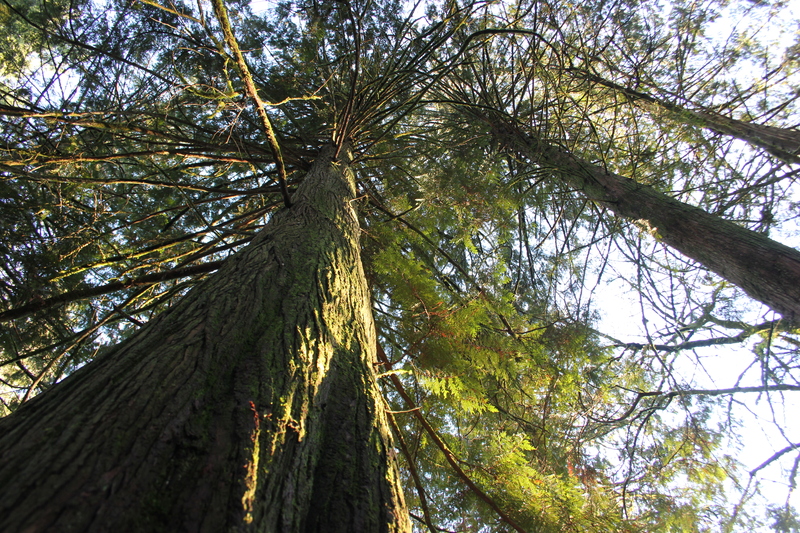 I use a Canon Rebel T2i with a lens leftover from a hand-me-down 1st generation Rebel. The lens was probably a kit lens, it says EFS18-55mm, 0.28m/0.9ft. I’m learning to use my EF 50mm f/1.8 lens, but very few of the photos you see here are taken with it (though I have one or two that may make it in next week’s post). Thanks so much for visiting!